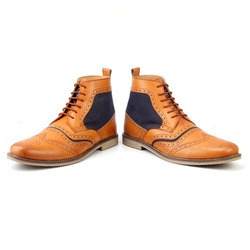 In order to cater to the numerous necessities of the patrons, we have been able to provide a wide range of Casual Leather Boot. Owing to the optimum quality material and ultra-modern machines applied in its making, we offer Mens Casual safety Boot to our valued clients at pocket friendly prices. 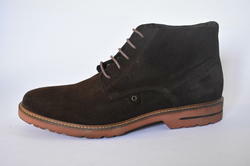 A CASUAL shoe item, this boot has been designed keeping in mind the growing numbers of fashion conscious men in general. The olive color boot also available in other pleasing colors has a cambril linning. A cent percent leather product, it oozes raw strength & a robust look & is appropriate for any casual setting. Being a prominent firm, we are engaged in offering a distinguished assortment of Ankle Length Casual Boot. This is trendy pair of shoes, made from faux leather for men's by Shoe Park. It compliments your formal and casual attires, use shoe box to protect from stain. - Widely demanded in functions, parties, etc. We are a unique name in the market to provide our honorable customers an exclusive range of Mens High Top Sneaker Shoes.